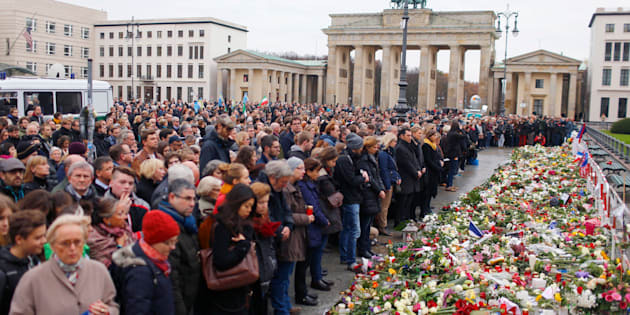 Germany has entered a period of national mourning to honor those killed during a suspected terrorist attack in Berlin on Monday afternoon. Twelve people died and 48 were injured when a man plowed a truck through a crowd of revelers at a Christmas market. The victims have yet to be publicly identified, but six are German citizens. Authorities continue looking for suspects after detaining and releasing a 23-year-old asylum-seeker from Pakistan, who denied involvement. German Chancellor Angela Merkel said she was “shocked, shaken and deeply saddened” by the bloodshed. Cloaked in black attire, she laid a white rose at the site of the attack on Tuesday morning. Addressing a nation gripped by anger and despair, Merkel encouraged Germans not to be afraid. The tragedy comes near the end of a year marred by similar violent assaults in Germany. Leaders and mourners around the world have joined in solidarity to commemorate the victims of the country’s worst attack in decades. A policewoman places a candle on behalf of a mourner at a makeshift memorial on Dec. 20. Hundreds of people joined Müller and Merkel at memorial services on Tuesday. A paper reading "Our love, mourning and thoughts are with you" lies between candles on Dec. at a makeshift memorial for the victims. Berlin illuminated its famous Brandenburg Gate with the colors of the German flag to honor the victims. U.S. President Barack Obama’s administration released a statement condemning the attack. Obama’s successor, President-elect Donald Trump, had a strongly worded reaction. “Our hearts and prayers are with the loved ones of the victims of today’s horrifying terror attack in Berlin,” a statement from Trump’s transition team read. “ISIS and other Islamist terrorists continually slaughter Christians in their communities and places of worship as part of their global jihad,” it continued, referring to the so-called Islamic State without evidence of the Berlin assailant’s motives or affiliations, or the victims’ religious backgrounds. French President François Hollande expressed his compassion and solidarity with Germany, Merkel and the families of the victims on Twitter. France, which has also endured several acts of terrorism this year, has intensified its security measures following the attack in Berlin. The vivid images from Berlin & Ankara have shocked us all. Our condolences are with all those who mourn and all who have been affected. British Prime Minister Theresa May took to Twitter to share her condolences with Germans, as well as with those affected by the assassination of Turkey’s Russian ambassador, Andrey Karlov, on the same day. ”German people should know we are all with them tonight, praying for families of victims. Freedom shall prevail,” tweeted Kosovo President Hashim Thaçi. Love and support for those affected by the attack poured in via social media, with hashtags like #IchBinEinBerliner (I am a Berliner) and #StandWithBerlin flooding Twitter, Facebook and Instagram. While similar to other solidary-oriented hashtags like #JeSuisCharlie, “Ich bin ein Berliner” also is a famous line from a 1963 speech by then-U.S. President John F. Kennedy, in which he stressed American support for West Germany after the erection of the Berlin Wall.